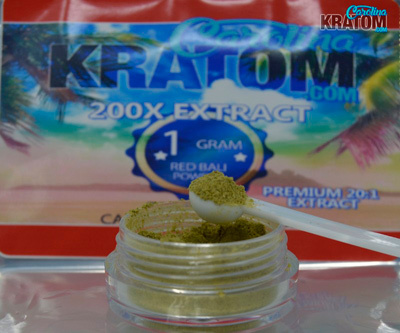 Carolina Kratom's 200x Red Bali extract is a popular when with customers who are on the go or just looking for the same results using just a fraction of the powder. 200x Red Bali extract is a 20:1 extraction therefore 20 times stronger than regular leaf powder. 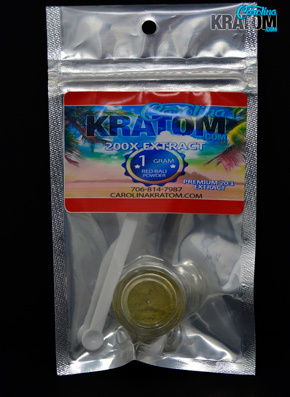 This allows for the same result with a MUCH smaller quantity due to the Kratom extraction process. 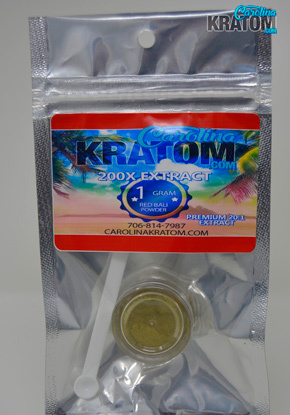 Carolina Kratom's 200x extract comes in a 1 gram container along with a small 100mg spoon all in a resalable bag to make sure your kratom stays fresh. All of Carolina Kratom's extracts are made in a lab here in the US to ensure the highest quality. During the extraction process the necessary alkaloids are extracted making the 200x Red Bali extract great used on it's own or combined with regular leaf. Customers of Carolina kratom have reported the 200x Red Bali extract to be helpful with pain and describe an energetic boost. Red Bali 200x extract by Carolina Kratom is a very powerful extract that flat out crushes other vendors extracts. Bottom line is if you want to try extracts and find the best selection then look no further! This is the 1st and last place you need to look for extracts at. Red Bali 200x extract by Carolina Kratom is one of my favorite extracts from any vendor. Taken on its own or mixed with your regular powdered Kratom you only need 1-2 scoops from the included spoon to wash away the the pain. Love this product from Carolina Kratom! Great for high pain days when you need some energy and pain relief! Works well to add to a partial dose of my normal powder!! I highly recommend all of their products! As stated before the 200x Red Bali by Carolina K is heads n tails above the competition and its effectiveness has never let me down. When Im really hurting this is what I use mixed with a normal red, 20 minutes later and all is well again.